Around 2,000 people watched the debut of Rotary International’s new virtual reality film, “One Small Act,” Tuesday at one of the largest simultaneous viewings of a VR film. The film follows the journey of a child whose world has been torn apart by conflict and supports the causes that Rotary champions, including polio eradication and peacebuilding. The story evoked strong emotions and sensations from the crowd. 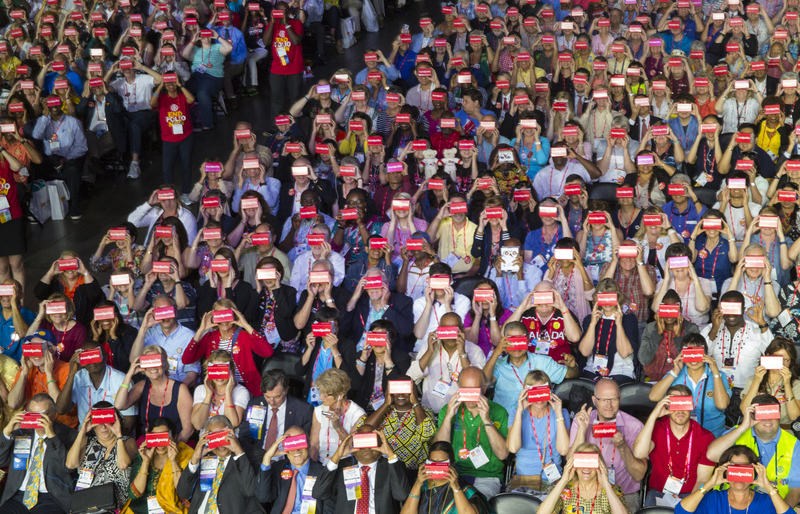 Angus Fraser, of the Rotary Club of Quirindi in New South Wales, Australia, was among those who registered for the event, which was a part of the Rotary International Convention in Atlanta, Georgia, USA. Virtual reality allows people to “see the magic of Rotary firsthand,” said RI President John F. Germ. Rotarians watch "One Small Act." Attendees are eager to show the film to others when they return home. “One Small Act” isn’t Rotary’s first VR film. “I Dream of an Empty Ward,” which premiered on World Polio Day last year, takes viewers to India to follow Alokita, a young woman who was paralyzed by polio as a child. The film is available for viewing on Rotary’s VR app, which is available for Android and Apple devices. Rotary members watch the debut of Rotary's VR film, "One Small Act."